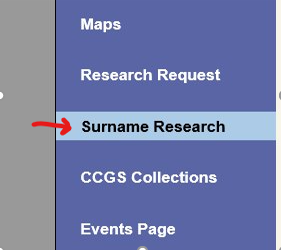 The Surname Research module is designed to allow you to share information about your ancestors with other researchers should you wish. Genealogy by nature is a social endeavor and your level of interaction with others can be controlled by you. To add your Surnames to the website you must first log in as a member. You will then select the Profile selection under the Members Only Menu. Complete the box with as much information as you can about your ancestors. Notice the Begin Year and End Year date boxes. You can restrict your Ancestor knowledge within time frames if you desire to reflect actual research or knowledge that you may have. Once you have completed the form you may select the Save button in the upper right-hand corner which will then create the record. Once you have entered the data you can find your Surname listed on the Surname Page from the main menu. With each selection on the page there are two options presented to the viewer. By selecting the “eye” icon you will presented with a printable format for the posted information. By selecting the ​ icon you are provided an option to email the owner of that Surname listing. A Surname Inquiry Emailer will allow a researcher to send you an email inquiring about the Surname listed on the website. The person making the inquiry will be required to identify themselves by an email account and will also need to select a box and enter the posted number to ensure the action is being completed by a human and not another computer. The email will be sent to you by the system ensuring your privacy. Your identity is not provided to the inquiring researcher. It is then your decision whether to respond to the researcher or to ignore the request. If you do choose to respond you will do so using your own email address.